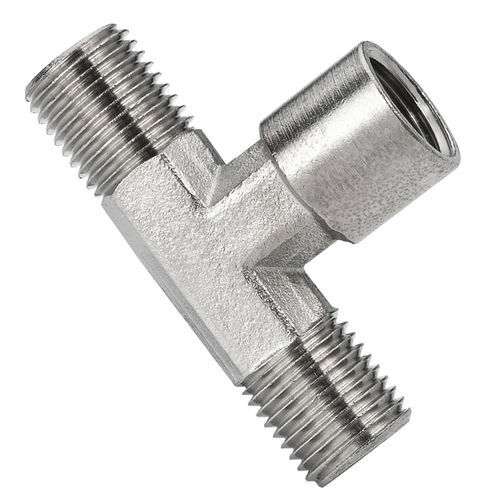 Brass pipe fittings male to female branch tee, constructed with nickel plated brass , is designed to connect two male ports perpendicular to a female port. Pneuflex's brass pipe fittings all meet specifications and standards of ASA, ASME and SAE. Brass pipe fittings are manufactured for low and medium pressure pipe line connections. The fluid can be water, refrigeration, instrumentation, hydraulic systems, grease, fuels, LP and natural gas. Application suitability in areas like air conditioner, refrigerator, automobile; choice of different heat treatment like annealing, normalizing, tempering, carburizing, induction hardening among others. Accommodate thread sizes ranging from 1/8" to 1".